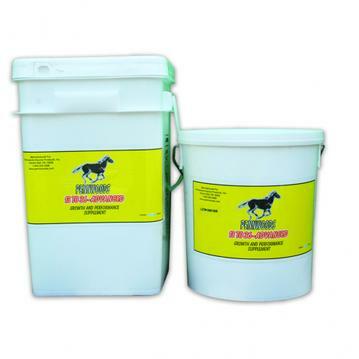 Pennwoods 13 to 36 Advanced is a special blending of proteins, fats, vitamins, and minerals formulated to meet the unique nutritional needs of horses spanning the period from one to three years of age. Yearling and two-year-old horses are at an age where feeding them like a weanling is no longer appropriate because of the change in their growth pattern, but they really shouldn't be fed like they are an adult horse either. It is a middle phase in their growth and development, and for best results, they should be provided with nutrition based on their physiological needs. Adequate amino acid specific proteins to complete their growth potential. Higher fat levels to support needed weight gain and demands of early performance. Elevated levels of Vitamin E & organic selenium for immune protection & hoof health.